Published book, “Sailing a Dream: To An Incredible Life,” can be purchased from Amazon (click above on book title). This book is also in the Rossmoor Library. 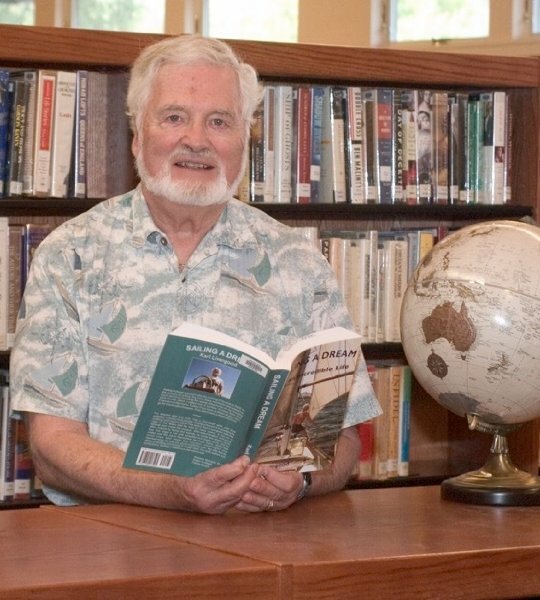 For many years Livengood had the desire to live on a sailboat and cruise the oceans. With determination and great effort, and helped by his family and friends, he his dream became a reality. "In 1981 I bought a 33 foot sailboard, which I named Aurora. I sailed her 20,000-plus miles from California to Mexico, along Central America, through the Panama Canal, up the Atlantic coast, then across the Atlantic and through the Mediterranean, ending ultimately in Marmaris, Turkey, where I sold her. My sailing career lasted more than twenty years. I soon bought a Dutch steel canal boat in the Netherlands and then spent the next ten years plying the rivers and canals of Northern Europe." Roberta Tennant, editor-in-chief at Falcon Books, says of the book, "As with any good seafaring yarn, the tale has its share of exciting adventures in rough seas. For both sailors and landlubbers, 'Sailing a Dream' is a marvelous trip." Karl and his wife, Betsy, now call Rossmoor their home. They still try to make two major trips a year. Together, they have traveled to five continents so far. Born in Cleveland in 1938, I grew up in the small town of Aurora. As a youth, I loved to canoe in Northern Ontario. Majoring in sociology and psychology, I attended Hiram College and Case-Western Reserve University, graduating with a Master's Degree in Social Work. My first job was working with street gangs in San Francisco's Mission District. My first sailboat was a Clipper MK21 which I trailered to México and crossed the Sea of Cortez. My life changed when I bought a ranch and joined the "Back to the Land" movement in the Trinity Mountains of Northern California. I built my own log house and barn while raising goats, rabbits, chickens, cows, and pigs. In 1980 I returned to Oakland and started a construction business which supported my sailing habits. "Aurora," my cruising boat, was purchased in 1981. In 1988 I sailed it to Mexico. I married JoAnne in 1990. In 1991 we started cruising together. JoAnne passed away in 2005; she was my wife and first mate. I currently live in Rossmoor (Walnut Creek), California with my new wife Betsy with whom I have shared more adventures and travels to many continents.